Did you ever find a resolution to this issue. We're seeing it in a Vista client. It seems to happen when using the scroll wheel on a mouse. Ditto the previous comments - Did you get this resolved? Talked to IBM - This is a known bug with 8.5.1 in 64-bit operating systems. This is going to be fixed in 8.5.2, and perhaps in 8.5.1 SP1. Only 64bit Windows? I am getting it with a Windows 7 32 bit install. I see the technote also said it was fixed in 8.5.1 FP2... I skipped FP2 and now I am on FP3. I haven't had an issue with this since upgrading to FP3. 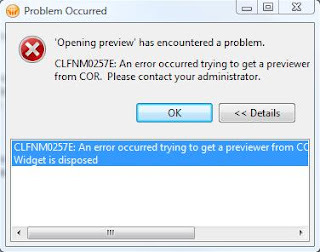 I still have this error even with 8.5.1 FP5 (on Seven 64).